Lady Gaga: Does Her Celebrity Engagement Ring Raise the Bar? Singer and superstar Lady Gaga got engaged to her longtime boyfriend Taylor Kinney on Valentine’s Day weekend. The celebrity engagement involved Kinney giving Gaga a one-of-a-kind huge heart-shaped engagement ring that includes a T and S for their initials. We could all see it sparkling on her finger when she sang at The Academy Awards recently. It harkens back to young love when everyone would write their initials in a heart, and it’s both romantic and lavish. 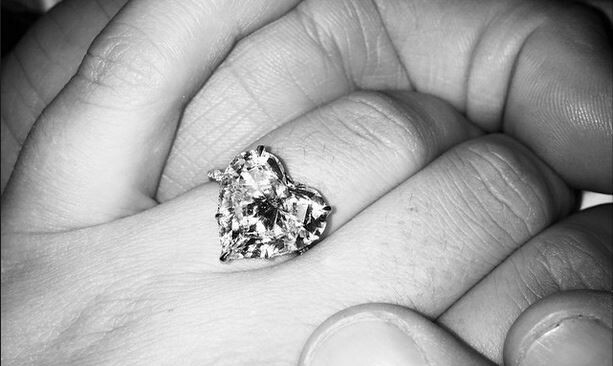 So, what does the magnitude of her celebrity engagement ring mean for everyone else – her followers and fans? Does it raise the bar, and possibly make non-celebrity couples who are now getting engaged feel that they have to do something extraordinary and unique in order to make their partner feel special? Getting engaged is a big deal — and not just because of the ring. There are so many pieces of love advice to consider as you figure out the best way to make it exceptional for both of you. Of course, there is no denying that the ring has become symbolic of the whole event. When it comes to Lady Gaga’s celebrity engagement, that has certainly been something the press has been focusing on. She and her ring are both distinctive and seem to suit each other perfectly. While that is wonderful for her, it is important to keep in mind that we are all original and rare, so what might be perfect for her won’t necessarily be right for your non-celebrity couple status. Your ring can be remarkable without having to be a showstopper. The idea that an engagement ring has to be original, handmade and/or very expensive can skew what everyone hopes for, and if those expectations are too high, you might end up missing the point of what you are actually doing – which is pledging your love to each other and agreeing to spend your lives together. I have seen many women who were let down by the engagement ring they received because it wasn’t the size, style or stone they had wished for. The engagement ring speaks to commitment and endurance, and the willingness to go the distance with your partner. With that in mind, try to keep what you envisioned realistic to the man you are with, the resources he has, as well as his interest and taste in jewelry. Just because he doesn’t design it or get you as big a ring as your girlfriend may have received, that doesn’t mean you are loved less. Whatever ring you receive will be testimony of his relationship and love and the desire to share his future with you. So when he pops the question and holds out the much-anticipated ring he chose for you, it can usher in excitement rather than disappointment. Keep it about for better or worse, rather than for bigger or worse. The bottom line is that an engagement ring does not have to be the only one of its kind, over-the-rainbow-fabulous to symbolize the love you share for each other and the commitment you are making to each other. For Lady Gaga it is a huge diamond heart, for you it might be something else, possibly not even a diamond but an emerald or a ruby. In the end, though, you both hope the ring will lead you to the same place – bringing in a life full of love and adventure together.